Workers got good news yesterday as they marked May Day. 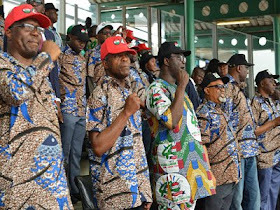 They will get a new minimum wage soon, the Federal Government assured them during the celebration of Workers Day at the Eagle Square in Abuja. Vice President Yemi Osinbajo, who broke the news, did not state the minimum wage. Labour is demanding N66,500 as minimum wage. Present were Nigeria Labour Congress (NLC) and Trade Union Congress (TUC) leaders and workers from unions that make up the NLC. Senate President Bukola Saraki was represented by Senator Victor Umeh (APGA, Anambra). Others at the event include former Edo State Governor Adams Oshiomhole, a one-time NLC president and some other former labour leaders and federal lawmakers. According to The Nation, Osinbajo said government would stick to the Constitution in the negotiation for the new wage. Under the Constitution, only the Federal Government can negotiate wages with workers because the issue is on the Executive List. Governors have been clamouring that they be allowed to negotiate with workers what to pay them. Osinbajo said since the issue is on the Exclusive List, it is the Federal Government’s responsibility to establish necessary social protection floor for workers. He said: “The argument for a national minimum wage, therefore, cannot be faulted because minimum wage is the minimum amount of compensation an employee must receive for putting in his or her labour and as such should be anchored on the principles of social justice, equity, and fairness. We believe that those who can pay above the social protection floor are free to do so, as many have been doing in many states and sectors of the economy. “This administration has no intention of presiding over the dismantling of the gains organised labour secured for its members almost four decades ago. “This administration has remained committed to improving the welfare of the Nigerian people. When we came into office at least 22 states were owing salaries, some for a whole year. If you recall in November 2015, the President said and I quote, ‘all my life I have always earned a salary, so I understand what it means when your salary is not paid or when it is not enough’. “Just last year, Mr. President speaking to governors visiting him again went back to the issue of salaries, ‘I don’t know how any of you can go to sleep at night knowing that your workers have not been paid’. The President’s concern for workers is not a theoretical or rhetorical one , but one borne out of experience and respect for the sweat of the working classes. “This is why we evolved mechanisms to bail out all the 36 states of the federation, to the tune of N1.91 trillion, in recognition of the shortfalls in their finances arising from the oil shocks of 2015/2016. We have extended this support regardless of party affiliation, to enable them settle the backlog of arrears of salaries and pensions of workers. “At the inauguration of the National Economic Council in 2015, President Buhari publicly declared that our administration will extend support to every state, because poverty is no respecter of ethnic group, religion or party affiliation. “While we do recognise that payment of salaries and pensions is essential; we are also conscious of the fact that the increasing cost of living and the recognition to ensure a fair and decent living wage has rendered the minimum wage Instrument obsolete. Accordingly, President Buhari inaugurated, on November 27, 2017, a Tripartite National Minimum Wage Committee to renegotiate the National Minimum Wage for our workers”. Labour, Osinbajo noted, has always been in the forefront of the push for a better Nigeria, starting from the struggles for independence; right through to the clamour for the restoration of the democratic order, and, in the last 19 years, for the sustenance of the freedoms guaranteed by our democracy. “I must also say that Nigerian organised labour has contributed actively towards helping Nigeria get out, in record time, of an economic recession arising from past economic mismanagement. He said: “It is regrettable that despite the enormous revenues Nigeria earned from oil in recent past, we still have problems with payment of salaries and pensions of workers due to mismanagement and corruption. I assure you that under our administration, we will ensure that we expend every kobo of public funds towards securing the welfare of all Nigerians”. On the country’s security challenges, the vice president said the government was “determined to secure the country more than ever before. “To this end, Mr President and the security council have been engaging in rigorous stock taking with a view to restructuring our security architecture to meet the challenges of the mindless killings in some parts of the country including marauding herdsmen, cattle rustlers and bandits. “It is our duty to secure the rights of farmers, and all citizens and to ensure that herders also can rear cattle in well-resourced ranches. But there are also criminals who want to stoke religious and ethnic crises. What is the explanation for anyone to go into a church to kill priests and worshippers? “We recognise that while the protection of lives and property is a primary responsibility of government; it is also incumbent on the citizens to share in this responsibility, as security is a collective responsibility. NLC President Ayuba Wabba urged the government to improve on security intelligence across the nation. He said the unemployment rate had increased to 18.80 per cent in the third quarter of 2017 from 16.20 per cent in the second quarter of 2017. According to him, the crisis of widening unemployment has been exacerbated by indiscriminate sack and retrenchment of workers by some public and private employers. “Unfortunately, the different levels of government that should be more concerned about protecting our people are the ones leading the campaign to push more Nigerians into the unemployment market. “That is why unemployment has remained high with an alarming proportion of our youth jobless. “The few that have a semblance of employment operate under very precarious conditions denoted by job insecurity, poor work conditions and gender discrimination. “The trend of factory closures has continued to spiral out of control turning our once lively centres of economic productivity into worship and entertainment centres”, he said. The NLC president said the increasing rate of unemployment has led to escalating poverty. More than 70 per cent of the population, he said, lived below the poverty line. “In fact, a number of international economic reports forecast that despite the significant difference in our population size, Nigeria may soon overtake India as the poverty capital of the world. “The reasons for endemic poverty in Nigeria are not far-fetched. Our economic structure does not provide the enabling space for mass industrialisation imbued with the capacity for sustainable jobs. “Our public policies and consumption pattern still encourage the export of jobs and the import of poverty,” he added. Wabba said industrialisation was a key driver of sustainable jobs and development for national economies and the foundation of good living standards. The NLC president noted that millions of youth joined the labour market annually without jobs, making them voluntary slaves to Europe and America. He said only the industry can provide sustainable jobs, living wages and necessary revenues for government to provide the needed infrastructure for development. For Nigeria to meet the Sustainable Development Goals 2030, especially SDG 9 dealing with industry and innovation, he said it must urgently innovate, revive closed textile, steel and engineering mills. “We must industrialise. We must copy China’s industrialisation drive which has within 20 years moved over 250 million people out of poverty through manufacturing and industrialisation. “We must stop exporting raw cottons, crude oil, mineral resources only to be importing finished textile, petroleum products from China, Europe and America. “Nigeria must make what it consumes, otherwise it will be consumed by the rest of the world, ‘’Wabba said.